A bill by Sen. Elizabeth Warren (D., Mass.) to allow a Native American tribe to continue a stalled Massachusetts casino project is being pushed by lobbyists for Malaysian gambling giant Genting, which invested close to $300 million in the project and risks losing it all. Warren's bill to help the Mashpee Wampanoag tribe build its proposed casino has raised eyebrows given her record on gambling—she supported efforts to repeal laws expanding gambling in Massachusetts, saying casinos are a "real problem economically for a lot of people," according to the Washington Times. Nevertheless, she introduced a bill that would reaffirm the tribe's rights to the casino land, allowing it to continue work on a $1 billion casino project that was halted by a U.S. District Court ruling that the federal government overstepped its authority to give the tribe the land. The biggest push behind the effort has come from the Genting Group, a Kuala Lumpur-based company with a global portfolio of casino businesses that has $249.5 million invested in the troubled project and is slated to manage the First Light Resort & Casino if it's completed, according to Malaysian reports. Genting disclosed in its 2015 annual report its $249.5 million investment in promissory notes from the Mashbee Wampanoag Tribal Gaming Authority. It gained no equity from the investment, which was intended to "establish" its "growing presence in the U.S."
There will be no return on investment until the casino is in operation and Genting is paid for management, an increasingly unlikely outcome that would result in Genting losing $274 million. In the case that no casino is ever built, the tribe says it won't even have to pay back the investments made by Genting. 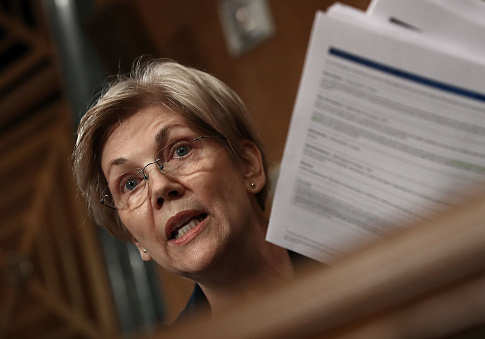 The team, which includes former congressman Richard Pombo, was actively lobbying both the Senate and House of Representatives on the issue as Warren's bill was introduced, the disclosure forms show. Neither Warren's office nor the firm responded to inquiries into whether there was a line of communication between the two. Dentons US LLP, which hired Gavel Resources on behalf of Genting, was paid $320,000 by Genting's U.S. subsidiary in the first quarter of 2018 to lobby on gaming issues. The firm began its lobbying effort after it became involved in the Massachusetts issue. 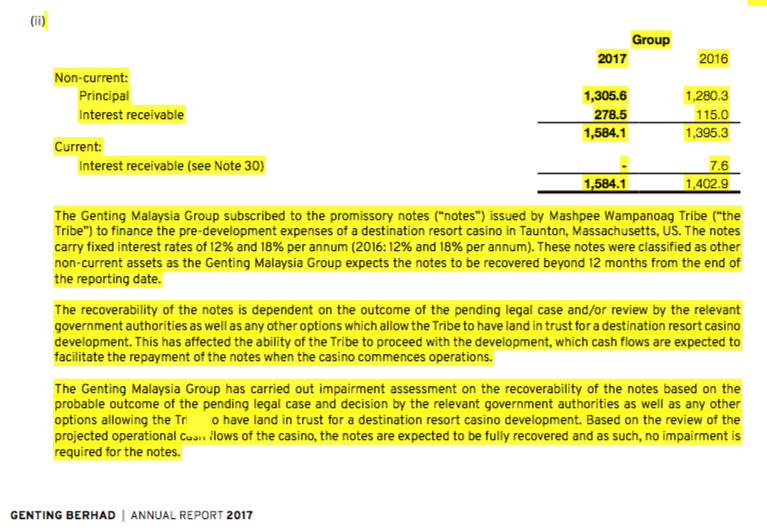 Genting's 2017 annual report acknowledges the closing window on its investment, but appears confident it will in the end be able to recover on its promissory notes, which carry fixed interest rates of 12 percent and 18 percent. "The recoverability of the notes is dependent on the outcome of the pending legal case and/or review by the relevant government authorities," it says. The company says its "impairment assessment on the recoverability of the notes" found that its investment will be fully recovered if the casino is built. Warren's effort to help the tribe on its casino was viewed by some as an effort to repair bridges she's burned with her false claims of Native American heritage. Her legislation was referred to the Committee on Indian Affairs. This entry was posted in Issues and tagged Elizabeth Warren, Gambling. Bookmark the permalink.